Pearl Harbor 2015 with the historic landmark home of Pacific Aviation Museum Pearl Harbor. Pacific Aviation Museum Pearl Harbor is a non-profit founded in 1999 to develop an aviation museum in Hawaii. 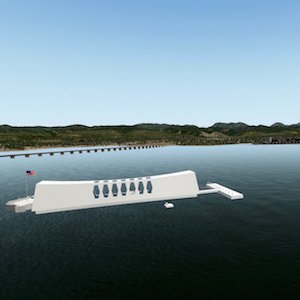 Part of Senator Daniel Inouye’s vision for a rebirth of Ford Island, the museum hosts a variety of aviation exhibits with a majority relating directly to the attack on Pearl Harbor and World War II. The first section of the museum, hangar 37, opened with the museum on December 7, 2006, and features much of the museum’s static exhibits. The museum’s hangars show damage from the attacks on Pearl Harbor from December 7, 1941. The museum has been involved in community events ranging from preservation of historical landmarks to educational tours throughout Hawai’i. The focus devoted efforts to restoring the Ford Island control tower and signed a lease with the Navy to begin repairs. Visitors to the museum gain access via tour bus from the Pearl Harbor Historic Sites on Halawa landing or use a US Military ID card at the Admiral Clarey bridge gate. The museum has received awards for their efforts to restore historical buildings and is listed as a top 10 aviation museum on TripAdvisor (Courtesy of WikiPedia). This is another HD scene by NAPS in Hawaii. Previously published version. Customized airport with a bunch of hangars, buildings, military objects, and some of Marc Leydecker’s © assets. Orthoscenery courtesy USGS. This package is tested on multiple platforms.